1.1. This consultation document, Site Evaluation (SE) - how we will evaluate sites (England), has been developed by Radioactive Waste Management Ltd (RWM) to bring together in one place the key relevant existing policy, legislative and regulatory requirements that will apply at various points throughout the Siting Process in order to support a consistent and understandable approach to the evaluation of sites which may be suitable to host a Geological Disposal Facility (GDF). In this Section we introduce our consultation, discuss the background to the SE and explain the territorial extent of this document. In Section 2 we explain the context of our SE and explain how a series of fundamental requirements have informed our choice of a series of Siting Factors and Evaluation Considerations that we will use in the evaluation of sites. In Section 3 we discuss the purpose of the SE and introduce our Siting Factors and Evaluation Considerations. Section 4 describes how RWM will implement Government’s Siting Process. In Section 5 we explain how RWM will undertake Comparative Assessments between different sites if necessary. We discuss how we will subject our work to oversight and scrutiny in Section 6. In Section 7 we explain how to take part in the consultation and present the questions we have asked in one place. We also include three Annexes which provide additional details on various matters discussed in the SE. 1.3. This consultation will be open until 31 March 2019. 1.4. There are several topics within the SE that we would like to hear your views on and which are included as questions in this consultation document. In particular, we would like feedback on how we have used the requirements to inform our identification of the six Siting Factors and underpinning Evaluation Considerations which we will use to inform our evaluation of areas and sites. 1.5. During the consultation period, we will be organising a number of events, which anyone interested can attend, where members of our team will be on hand to discuss the SE and answer any questions about it. The details of these events will be published on our website. 1.6. We will carefully consider all consultation responses and will use these to help develop our approach. Where permission is given, a summary of all responses received will be published on our website. 1.7. As a pioneer of nuclear technology, the UK has accumulated a legacy of higher activity radioactive waste and material. This is being stored safely on an interim basis at nuclear sites across the UK. More will be produced as existing facilities reach the end of their lifetime, are decommissioned and cleaned up, as well as through the operation and decommissioning of new nuclear power stations. 1.8. In addition to existing wastes, there are some radioactive materials that are not currently classified as waste, but would, if it were decided at some point that they had no further use, need to be managed as wastes through geological disposal. These include spent fuel (including spent fuel from new nuclear power stations), plutonium and uranium. 1.9. RWM is a wholly-owned subsidiary of the Nuclear Decommissioning Authority (NDA), and is the body responsible for implementing geological disposal of higher activity radioactive wastes. 1.10. Government policy 1 envisages that RWM will act as the developer of a GDF for such wastes. As such, RWM will be responsible for ensuring that the siting, construction, operation and eventual closure of a GDF are carried out in a manner which adheres to, and complies with, the UK’s high standards of safety, security and environmental protection, as well as applicable requirements which are set out in relevant policy documentation. 1.11. Geological disposal involves placing radioactive waste deep underground to ensure that the hazardous materials are kept away from people and the environment, by isolating and containing the waste in a suitable geological environment for the time required for the radioactivity associated with them to naturally reduce. Figure 1 presents an indicative image of how a GDF to accept the UK’s higher activity wastes may look. 1.12. The wastes that will be disposed of in a GDF are referred to as the ‘inventory for disposal’. The types and amounts of waste that make up this inventory for disposal are important because the layout and design of any GDF will need to be tailored to them, and also because communities considering hosting a GDF will want to be clear about what wastes are destined for it. 1.13. Government policy establishes a consent-based approach for RWM to engage and work in partnership with communities and relevant principal local authorities in England for the purposes of identifying a suitable location for the development and operation of a GDF. This policy-based process is referred to in this SE as the Siting Process and is discussed in further detail in Section 2. 1.14. A GDF needs to manage the inventory of higher activity waste for disposal to protect people and the environment, both now and in the future. 1.15. This is achieved through the various requirements which are placed on organisational management, site selection and evaluation, design of a GDF and its construction, operation and closure. 1.16. These requirements are set out in RWM’s published Disposal System Specification 2 (DSS). 1.17. The DSS is one of the key documents in RWM’s generic Disposal System Safety Case 3 (gDSSC). In Section 2, we explain further how RWM uses the DSS in its work, how the DSS draws together the requirements that a GDF will need to satisfy, and how this has also informed our choice of Siting Factors and Evaluation Considerations. 1.19. These requirements are derived from Government policy, and in particular from Chapter 6 of Implementing Geological Disposal – Working with Communities, An updated framework for the long-term management of higher activity radioactive waste (the Working with Communities Policy). These requirements relate to the overarching policy of geological disposal, RWM’s role in implementing geological disposal, and the Government Siting Process that is to be followed by RWM in engaging with communities during the Siting Process. These requirements are referred to in the SE as the ‘Siting Process Requirements’. 1.20. These requirements are derived from the draft National Policy Statement for Geological Disposal Infrastructure (NPS) which establishes the planning policy framework within which RWM’s applications for development consent for geological disposal infrastructure (in England) will be considered by the Secretary of State under the Planning Act 2008. These requirements are referred to in the SE as the ‘NPS Requirements’. The NPS was published in draft for consultation by HM Department for Business, Energy and Industrial Strategy (BEIS) between January and April 2018. The preparation of the draft NPS was informed by both an Appraisal of Sustainability (carried out in a manner so as to satisfy the requirements of the Strategic Environmental Assessment Directive[^4] and a Habitats Regulations Assessment. As the NPS is in draft form only, the requirements that it sets out are not currently captured in RWM’s DSS, but once the draft NPS has been formally designated, the DSS will be updated accordingly. 1.21. These requirements are derived from the key legislation and regulatory instruments and regimes (as well as any relevant associated guidance regarding those regimes) which relate to the design and assessment, construction, operation and closure of a GDF, notably those requirements relating to land-use planning legislation, Environmental Impact Assessment[^5], Habitats Regulations Assessment[^6], nuclear site licensing[^7] and environmental permitting[^8]. These requirements are referred to in the SE as the ‘Legal Requirements’. 1.22. In the SE, we refer to the Siting Process Requirements, NPS Requirements and Legal Requirements together as the ‘Requirements’. 1.23. The SE is designed to summarise, in simple and understandable terms, the broad types of issues that will need to be considered by RWM during the Siting Process for the purposes of complying with all relevant Requirements, and enable RWM to gather the necessary information for the purposes of making applications for the key consents that will be needed to construct and operate a GDF. 1.24. The SE seeks to achieve this by using the Requirements to inform six broad Siting Factors, namely: Safety, Community, Environment, Engineering feasibility, Transport and Cost. 1.25. These six Siting Factors have been chosen to reflect what RWM believes, on the basis of international GDF projects and of UK infrastructure projects of similar size and complexity, are likely to be the key areas of focus for discussion with communities participating in the Siting Process. The six Siting Factors are intended to assist communities in understanding the various matters that RWM will necessarily need to consider as it evaluates the suitability of sites for hosting a GDF in accordance with the relevant Requirements. In order to provide greater clarity on how RWM intends to approach its siting analysis and discussions with communities, the Siting Factors have been further broken down into a series of Evaluation Considerations which sit beneath each Siting Factor. These are explained in Section 3. 1.26. The SE aims to draw together the Requirements which RWM will necessarily be required to comply with during the Siting Process, whether as part of its engagement and dialogue with communities or its applications to secure the necessary consents for the construction and operation of a GDF. It does not establish any new Requirements to be applied by RWM during the Siting Process. It does not remove, enhance, alter or create any of the existing Requirements. It simply brings together the Requirements in a manner that is designed to ensure that the wide discretion that is afforded to RWM by the relevant policy framework is applied in a transparent and consistent manner throughout the Siting Process. 1.27. If the Requirements change in future, for example following a change in the legislative or policy framework relating to geological disposal and/or the Siting Process for a GDF, the SE may need to be revisited and updated in order to properly reflect those changes. RWM will discuss any proposed changes to the SE with communities engaged in the Siting Process, and if it is appropriate undertake further consultations. To ensure an open and transparent siting process, any updates to the SE will be published. 1.28. Radioactive waste management is a devolved matter, meaning that each of the individual devolved administrations in the United Kingdom has responsibility for setting its own policy. 1.29. This SE and the consultation cover England only. 1.30. In England, the overarching policy framework for the implementation of the geological disposal programme is set out in Implementing Geological Disposal – Working with Communities, An updated framework for the long-term management of higher activity radioactive waste. 1.31. The UK Government is proceeding on the basis that only one GDF will be necessary to take the entire inventory for disposal. However, it is recognised that more than one site might be required. Within the SE, reference is made to the selection of a site for underground investigation, construction and operation, but it is appreciated that there may be more than one site selected e.g. if there is not a large enough volume of suitable rock to take the entire inventory for disposal. 1.32. As radioactive waste management is a devolved matter, we are intending to produce a separate SE for Wales to reflect the different policy and legislative framework that exists. This, along with the policy position in Northern Ireland and Scotland, is explained further in Annex A - Devolved Administrations of this document. 2.1. As explained in Section 1, RWM’s site evaluations will respond to Requirements from three principal sources. These are discussed further in the following sections. 2.2. The Siting Process Requirements are derived from the Government’s Working with Communities Policy, which sets out how RWM will work in partnership with interested parties, communities and the principal local authorities that represent those communities, in order to identify a suitable site for the development of a GDF. 2.3. The process to select a site for a GDF could take around up to 20 years. Figure 2 provides an overview of the Siting Process. It identifies the key activities that will combine to deliver a successful process, and the anticipated timescales associated with each key activity. 2.4. The Working with Communities Policy explains that discussions on a proposed location for a GDF can be initiated by anyone or any group of people with an interest in the siting process, and who wish to propose an area for consideration. These conversations are called Initial Discussions. 2.5. Once parties have had an initial exchange of information and agree that the proposal merits further consideration, the Interested Party/ies and RWM must inform all relevant principal local authorities and open up discussion more widely in the community. 2.6. In England, the relevant principal local authorities will be all of the district, county or unitary authorities that represent all or part of the area under consideration. A Working Group will be formed of the Interested Party, RWM, an independent chair and facilitator. 2.7. The Working Group will identify the geographical area within which RWM will be permitted to seek potentially suitable sites for a GDF. This is called the Search Area. All relevant principal local authorities must be invited to join the Working Group, but it can still proceed in their absence. 2.8. The Working Group will start to gather information about the people and organisations in the area that are likely to be affected or have an interest in a GDF with a view to identifying members for a formal Community Partnership. 2.9. This Community Partnership will include community members, organisations, RWM and at least one relevant principal local authority. It will provide a vehicle for sharing information with the community and for finding answers to the questions the community may have about geological disposal, the siting process and how they, as a community, could benefit. 2.10. In order for the Community Partnership to form and operate, at least one relevant principal local authority must agree to participate. 2.11. A community can withdraw from the Siting Process at any time up until it has taken a Test of Public Support (see below); this is called the Right of Withdrawal. The decision on whether to withdraw the community will be taken by the relevant principal local authority/ies on the Community Partnership. Where there is more than one relevant principal local authority on the Community Partnership, all must agree; no single relevant principal local authority will be able to unilaterally invoke the right of withdrawal. 2.12. RWM can also withdraw at any time, for example if it determines that the Siting Process is unlikely to be successful in a particular community. 2.13. Before a decision is made to seek development consent from the Secretary of State, or regulatory approvals for a GDF from the Environment Agency and the Office for Nuclear Regulation, there must be a Test of Public Support by the Potential Host Community to demonstrate it is willing to host a GDF. 2.14. Relevant principal local authorities on the Community Partnership will have the final say on when to undertake this Test of Public Support in order to seek the community’s views on hosting a GDF. All relevant principal local authorities on the Community Partnership must agree to hold the Test of Public Support for it to go ahead. 2.15. RWM has produced Community Guidance4 which explains how it plans to work in partnership with communities throughout the Siting Process. 2.16. We summarise in Figure 3 how RWM envisages that it will implement Government policy and progress through the Siting Process; this is discussed further in Section 4. 2.17. In addition to the Siting Process Requirements, there are a number of matters in the draft NPS 5 which RWM will necessarily need to consider in its evaluation of potential sites in England. 2.18. The draft NPS, when finalised, will establish the formal requirements to which the Secretary of State must have regard when determining applications made by RWM for development consent for certain geological disposal infrastructure under section 30A of the Planning Act 2008. As the NPS is not yet finalised, RWM has considered the draft NPS in the production of this SE. 2.19. The requirements set out in the draft NPS are not currently captured in RWM’s DSS. Once the draft NPS has been formally designated, the DSS will be updated as required. RWM may carry out further public consultation on the SE if this is appropriate when such updates are being considered. 2.20. Sections 4 and 5 of the draft NPS establish a series of Assessment Principles and Impacts that a developer of geological disposal infrastructure should consider and assess when proposing a site for development. Later in the process, RWM’s applications for development consent (for both the deep investigatory boreholes and a GDF itself) will need to clearly demonstrate compliance with the requirements established by the finalised NPS, and how the application takes into account the Assessment Principles and Impacts identified in the finalised NPS. RWM will need to ensure that these matters are considered when evaluating prospective areas and sites in order to identify any matters which may prevent a successful application for development consent being made. 2.21. Of particular note and relevance to the SE are the Assessment Principles in Section 4 of the draft NPS which are summarised in Annex B – Draft National Policy Statement Requirements. Environmental Permit(s) regulating certain environmental aspects of a GDF, granted by the Environment Agency (EA) under the Environmental Permitting (England and Wales) Regulations 2016. 2.23. The evaluations that RWM will carry out during the Siting Process, using the Siting Factors and Evaluation Considerations identified in the SE, will be used to gather information that will be required for the purposes of underpinning the applications that will be made for the key planning and regulatory consents. It should be noted that the UK’s nuclear and environmental regulators have no formal regulatory role in selecting a site for a GDF. Their regulatory role begins after sites have been selected for further investigation. The EA will have a formal role from the time when sites for deep borehole investigations are selected. The ONR will have a formal role from the time when a site for a GDF has been selected. The regulators will engage with stakeholders as requested to explain the regulatory processes and their role. They will only license or permit a GDF if it can be shown to meet the UK’s stringent regulatory requirements for protection of people and the environment. 2.24. More detail on the Legal Requirements that RWM must meet is provided in Annex C – Legal Requirements. 2.25. RWM has already developed and maintains a gDSSC and a DSS which is based on the key existing Requirements relevant to organisational management, site selection and evaluation, design of a GDF and its construction, operation and closure. As such the gDSSC and DSS have been key reference points in RWM’s development of the Siting Factors and Evaluation Considerations set out in the SE. 2.26. The gDSSC is a suite of documents that includes a specification, designs and assessments that consider the safety and environmental implications of the geological disposal of radioactive waste. 2.27. The gDSSC is described as ‘generic’: it is not site-specific as no site has yet been identified for the construction and operation of a GDF. It sets out how a GDF could be designed, constructed and operated safely, in compliance with applicable Requirements, in a range of geological environments. 2.28. The gDSSC underpins the ongoing process for packaging waste in readiness for future disposal in a GDF. 2.29. The DSS, which is part of the gDSSC, describes the Requirements placed on the disposal system and forms the basis of RWM’s existing generic design and assessment work. The underlying Legal Requirements (relevant in the context of what constitutes a suitable site) are therefore captured in RWM’s published DSS. 2.30. There is agreement internationally that geological disposal provides a safe long-term management solution for higher activity waste. This is expressed in documents such as the Joint Convention on the Safety of Spent Fuel Management and on the Safety of Radioactive Waste Management and in the International Atomic Energy Agency (IAEA) Safety Standards Series document Disposal of Radioactive Waste. 2.31. The IAEA Safety Series does not directly form part of the UK’s regulatory regimes, although the UK Government and the UK’s independent nuclear and environmental regulators do use them to inform the development and review of their guidance and requirements. RWM has therefore decided to treat the IAEA safety requirements for radioactive waste (SSR-5) as requirements in our DSS because they will necessarily shape RWM’s assessment of the suitability of geographical areas and sites – but in the event of any conflict between international standards and UK legislation, the latter will take precedence. 2.32. The requirements set out in the DSS are not influenced by any particular site, and apply to the overarching consideration of areas or sites which RWM will evaluate. As such, the high level requirements identified in Part A of the DSS need to be complied with regardless of the area or site being evaluated, such that if the requirements cannot be satisfied then it is unlikely that the area or site will be suitable for a GDF. Are there any other sources of high level Requirements, other than the Siting Process Requirements and the Legal Requirements identified, that you think should be reflected in the Site Evaluation and why? to support RWM’s future applications for permissions, including land use planning consents, environmental permits and a nuclear site licence. 3.2. The SE is designed to summarise, in simple terms, the broad types of issues that will need to be considered by RWM working in partnership with the community during the Siting Process for the purposes of complying with all relevant Requirements, and enable RWM to gather the necessary information for the purposes of making applications for key consents. 3.3. The SE seeks to achieve this by grouping the Requirements into six broad ‘Siting Factors’. These six Siting Factors are designed to reflect what RWM believes are likely to be, on the basis of international GDF projects and of UK infrastructure projects of similar size and complexity, the key issues for discussion with communities participating in the Siting Process and the UK’s independent nuclear and environmental regulators. 3.4. The six Siting Factors that RWM has developed cover the broad topics of Safety, Community, Environment, Engineering Feasibility, Transport and Cost. These are set out in Table 1 below. 3.5. In order to guide and provide greater clarity to RWM’s discussions with communities and site evaluations, the SE also breaks the six Siting Factors down further into a series of Evaluation Considerations that sit beneath each Siting Factor. These are set out in Table 2 below. 3.6. Siting Factors or Evaluation Considerations cannot always be considered in isolation, and they are therefore designed to be used holistically throughout the Siting Process to enable RWM to form a qualitative view, based on the information available and acquired, of a prospective area’s potential to host a GDF. 3.7. To the extent that there is any duplication of, or overlap between, the Siting Factors, the SE does not require that the Requirements be applied or interpreted differently, or in any particular manner. The Siting Factors are simply designed to group the Requirements into broad areas to enable a consistent and transparent approach to the evaluation of potential areas and sites. Safety – the characteristics of both the surface environment and sub-surface geological environment at any given geographical location and the safety implications on construction, operation, closure and post- closure of a GDF at that location. Community – the potential socio-economic implications of constructing, operating and closing a GDF at any given geographical location, including potential opportunities to enhance the wellbeing of the Potential Host Community. Environment – the characteristics of both the surface environment and sub-surface geological environment at any given geographical location, and the potential environmental impacts of constructing, operating and closing a GDF at that location and the ability to mitigate those potential impacts. Engineering Feasibility – the characteristics of both the surface environment and sub-surface geological environment at any given geographical location, and the feasibility of constructing, operating and closing a GDF at that location. Transport – the potential implications for national and local transport networks of constructing, operating and closing a GDF at any given geographical location, including any enhancements to local networks that may be required at that location and the ability to mitigate those potential impacts. Cost – the characteristics of both the surface environment and sub-surface geological environment at any given geographical location and the implications of those characteristics on the potential cost (including value for money assessment) of implementing a facility at that location. Do you agree with the Siting Factors we have identified? Are there any other Siting Factors that should be included and why? 3.8. The six Siting Factors provide the broad areas for evaluation – they are the overarching subject headings which will be used to help guide and shape RWM’s site evaluations and discussions with communities. 3.9. In order to help focus those evaluations and discussions further, particularly when evaluations become more detailed later in the Siting Process, RWM has used the Requirements to identify a number of Evaluation Considerations which underpin each of the Siting Factors. For the purposes of consistency, the Evaluation Considerations are aligned closely with the DSS. 3.10. Table 2 to Table 7 set out the Evaluation Considerations that RWM has developed for each of the six Siting Factors. The footnotes in these tables described as ‘Table x’ refer to Tables in RWM’s DSS. The characteristics of both the surface environment and sub-surface geological environment at any given geographical location and the safety implications on construction, operation, closure and post-closure of a GDF at that location. Safety Case Requirements 6 - The ability to respond to the High level Management Requirements for a GDF to ensure that it can be designed, constructed, operated and closed in accordance with those Requirements. Construction Safety 7 - The ability to construct a GDF in accordance with all Requirements relating to safety (i.e. in accordance with a design described in an appropriate safety case). Operational Safety 8 - The ability to operate a GDF in accordance with all Requirements relating to safety. Post Closure Safety 9 - The ability to close a GDF in accordance with all Requirements relating to safety (i.e. the potential of a site to isolate and contain radioactive waste away from people and the biosphere for the time required for the radioactivity to naturally reduce). The potential socio-economic implications of constructing, operating and closing a GDF at any given geographical location, including potential opportunities to enhance the wellbeing of the Potential Host Community. Community wellbeing 10 - The wellbeing of the relevant community will be considered in line with all Requirements relating to, for example, potential socio-economic, health and equalities impacts 11. Cumulative effects of potential infrastructure projects within a region and potential impacts of pollution and noise in respect of any adverse effects on equality groups will be considered. Host Community Vision 12 - The consideration of whether the proposed development of geological disposal infrastructure can be aligned with the Potential Host Community’s objectives or vision. The characteristics of both the surface environment and sub-surface geological environment at any given geographical location, and the potential environmental impacts of constructing, operating and closing a GDF at that location and the ability to mitigate those potential impacts. Protected Habitats and Species 15 - The potential impact of proposed geological disposal infrastructure on designated conservation sites will be considered in line with Requirements relating to protected habitats and species. The characteristics of both the surface environment and sub-surface geological environment at any given geographical location and the feasibility of constructing, operating and closing a GDF at that location. Sustainable Design 16 - The ability to apply ‘good design’ to produce sustainable infrastructure. Constructability 17 - The ability to design, construct, operate and close a GDF in line with Requirements. Security 18 - The ability to design, construct, operate and close a GDF in accordance with all Requirements relating to security. Safeguards 19 - The ability to design, construct, operate and close a GDF in accordance with all Requirements relating to nuclear safeguards. Waste conditioning and packaging 20 - The consideration of whether there are any particular characteristics of a potential area or site which may prevent wastes that have already been packaged from being accepted. This will include the consideration of whether there are any particular characteristics of a potential area or site that are likely to require significant changes to current waste packaging advice. Inventory for Disposal 21 - The consideration of whether there is sufficient volume of available competent rock at repository depth to host GDF infrastructure and to manage the agreed waste inventory, and how flexible to potential changes in waste quantities the potential site could be. Retrievability 22 - The consideration of whether a GDF could be designed, constructed and closed in accordance with Requirements, recognising that during the operational stage waste could potentially be retrieved, if there was a compelling reason to do so. The potential implications for national and local transport networks of constructing, operating and closing a GDF at any given geographical location, including any enhancements to local networks that may be required and the ability to mitigate those potential impacts. Transport Safety 23 - The ability to design, construct, operate and close a GDF in accordance with all Requirements relating to transport safety. This will include consideration of Requirements relating to the safety of transport of both radioactive materials (regulated by the Office for Nuclear Regulation) and non-radioactive materials. Transport Security 24 - The ability to design and operate a GDF Transport System in accordance with all Requirements relating to security. Transport impact 25 - The potential impact of proposed transport infrastructure and associated traffic movements will be considered in line with Requirements relating to transport impact, including the ability to avoid, mitigate or compensate for those impacts. The characteristics of both the surface environment and sub-surface geological environment at any given geographical location and the implications of those characteristics on the potential cost (including value for money assessment) of implementing a facility at that location. Construction costs 26 - The potential costs of characterising and constructing a GDF and its associated transport system at a given geographical location will be considered in line with Requirements relating to, for example, public expenditure and value for money. Lifetime costs 27 - The potential costs of operating and closing a GDF and its associated transport system at a given geographical location will be considered in line with Requirements relating to, for example, public expenditure and value for money. Schedule of Waste Receipt 28 - The ability to meet an appropriate schedule of waste receipt throughout the lifetime of the programme. 3.11. It is acknowledged that some overlaps and interactions between the six Siting Factors and Evaluation Considerations will occur and will need to be understood and accounted for, so as not to overstate aspects of the evaluation. For example, it is acknowledged that enhancements to the transport network may generate environmental impacts and have cost implications that need to be considered as well as impacts or benefits for the community. 3.12. Our evaluations will always consider whether a GDF is deliverable within the geographical constraints of the area(s) and site(s) under consideration. The evidence gathered to evaluate areas and sites against any of the Siting Factors and Evaluation Considerations may potentially identify reasons for RWM to withdraw from the Siting Process in the area under consideration, even in the event of a community being willing to continue. 3.13. The site evaluation approach to be used will not involve ranking or scoring of the Siting Factors and Evaluation Considerations. It will be a qualitative, evidence-based and iterative process. 3.14. The information gathered under the six Siting Factors, and the relevant underlying Evaluation Considerations will provide the overall structure for our site evaluations and, at the relevant time, the siting recommendations that we will make to Government. Information gathered will also be used to support, at the relevant time, RWM’s applications for the necessary consents, permits and licences that are required for the construction and operation of a GDF. Do you agree with the Evaluation Considerations we have identified? Are there any other Evaluation Considerations that should be included and why? Is there anything else that you think we should consider in our site evaluations and why? 4.1. As discussed in Section 2 and summarised in Figure 3, RWM will work in partnership with Interested Parties, communities and the principal local authorities that represent those communities to implement Government policy to identify a suitable site for the development of a GDF. 4.2. During this time, RWM will undertake increasingly detailed evaluations, as the information and data available in respect of the relevant area increases. 4.3. It is recognised that the level of information available will vary between different areas and sites being evaluated. 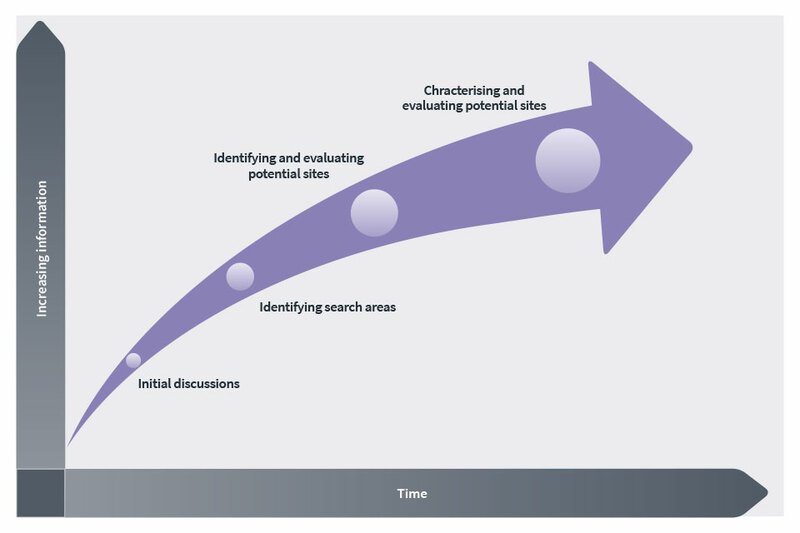 In general, it is assumed that available and relevant information will increase as potential areas and sites progress through the Siting Process. Figure 4 presents an overview of how the level of relevant information about a given geographical area will increase over time. 4.4. As such, our evaluations early in the Siting Process will necessarily recognise higher levels of uncertainty, with those areas of uncertainty being used to inform the type and scope of necessary future work and studies. Later on in the Siting Process, as the levels of information, knowledge and data increases, RWM will be in a position to undertake increasingly detailed evaluations and provide robust siting recommendations to the Government. These recommendations will be used by Government to inform the decision on which areas or sites to progress to Site Characterisation, underground investigation, construction and operation. 4.5. Up until the beginning of Site Characterisation, it is anticipated that most of the information being evaluated by RWM (both existing and newly-commissioned surface based surveys) will be focused on the surface sites with sub-surface information limited to existing desk-based information such as that provided through National Geological Screening or potentially newly-commissioned non-intrusive geophysical surveys. 4.6. We anticipate that the majority of new sub-surface information from techniques such as seismic surveys, shallow and deep boreholes, down-hole testing and sampling etc., will be generated during the Site Characterisation work that we undertake. It will be at this point where the evaluations will significantly increase in detail and complexity with a much greater degree of information being made available including through the site-specific safety assessments which RWM would undertake. 4.7. The remainder of this section explains at a high level how RWM envisages it will implement the Working with Communities Policy and progress through the Siting Process. 4.8. Early evaluations are likely to focus on safety, making use of National Geological Screening information to inform discussions about the potential for finding a suitable site in the area under consideration. Alongside this, RWM will also consider at a very high level the information available under each of the Siting Factors. 4.9. At this stage in evaluations, RWM will only use existing readily available information to understand whether the area may be potentially suitable to host a GDF. 4.10. If the area suggested by the Interested Party is small, the evaluations during initial discussions may need to extend beyond this area in order for RWM to take an informed view on the surrounding geological conditions. 4.11. RWM will gather a range of information to understand the character and notable features of the relevant local area, together with any local issues and to answer questions the community might have. 4.12. As part of the Working Group, RWM will support identification of a Search Area in accordance with the Working with Communities Policy. 4.13. RWM will also explain the key information gaps that will inevitably exist at this early stage which would be used to inform a future work programme to be agreed by the Community Partnership. 4.14. This is the first time in the Siting Process when surveys will be commissioned and RWM will start to acquire new information about the Search Area. For example, surveys on ecology, transport, noise, air quality, etc. may be commissioned. 4.15. Evaluations at this point in the Siting Process will necessarily start to become more detailed using the Siting Factors and Evaluation Considerations, but will still be very much focused on surface features of the Search Area. 4.16. If considered beneficial and necessary at this point, RWM may also decide to undertake non-intrusive geophysical survey work in order to help shape understanding of the area. 4.17. Much of the information produced at this stage will also be used to support Development Consent Order (DCO) applications and the Environmental Permit applications for boreholes if a site is recommended to progress into Site Characterisation. 4.18. It may be necessary to undertake a comparative assessment if several communities are still actively engaged in the process. A recommendation will be made to Government on the site or sites to be characterised – this means deep borehole investigations. This is discussed further in Section 5. 4.19. RWM will need to apply for a DCO and for an Environmental Permit(s) to carry out deep borehole investigations. Information gathered up until this point, informed by the Siting Factors and the Evaluation Considerations, will be used for the purposes of RWM making the relevant applications for a DCO and an Environmental Permit(s). 4.20. These investigations will test the geological conditions at potential site(s) to assess whether a GDF could be designed, constructed, operated and closed safely in accordance with the Requirements. 4.21. RWM will begin to generate the majority of new sub-surface information. It will be at this point where the evaluations will significantly increase in detail and complexity with a much greater degree of information being made available, including the site-specific safety assessments which RWM will undertake. 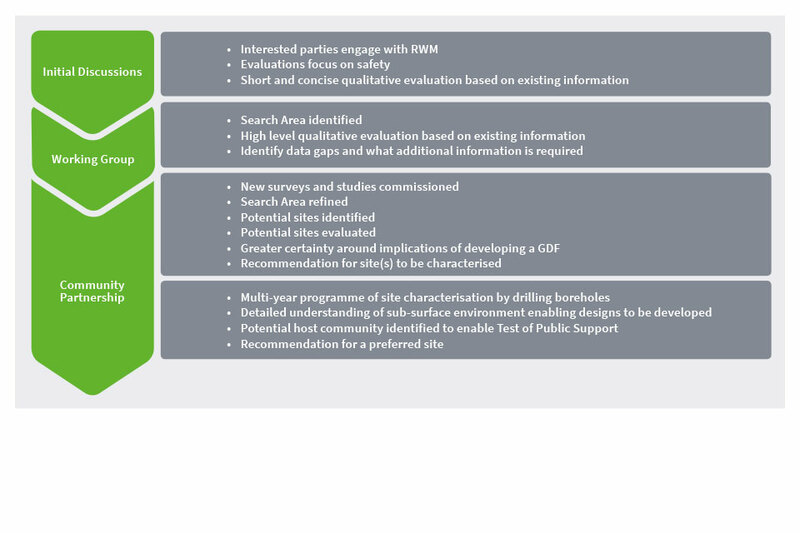 direct physical impacts associated with underground investigations, construction and operation of the GDF (identified though environmental impact assessment work carried out to support RWM’s engagement with communities and its development consent applications). 4.23. Based on the information gathered through the deep borehole investigations, and the on-going discussions within the Community Partnership, RWM will evaluate the geographical area comprised by the Potential Host Community and its potential suitability to host a GDF. 4.24. A Test of Public Support will have to be carried out to confirm whether the relevant community is willing to host a GDF. 4.25. Depending on the outcome of the Test of Public Support, RWM will prepare a recommendation to Government as to which site to select for a GDF. 4.26. At the appropriate time, RWM will use the information gathered to inform its applications for development consent, environmental permits and a nuclear site licence required for the construction and operation of a GDF. 5.1. Periodically, comparative assessments may be required to select from a number of competing areas or sites to progress through the Siting Process. selection of a site for underground investigation, construction and operation of a GDF. 5.3. RWM’s approach to comparative assessments, if required, will be one premised on an open and transparent approach based on the holistic consideration of the Requirements through the Siting Factors and underpinning Evaluation Considerations. 5.4. When undertaking comparative assessments, we will also consider the extent to which the community is engaged. 5.5. RWM will undertake qualitative evidence-based evaluations using the available information of how the potential sites being evaluated compare. In line with our evaluation approach this will not involve ranking or scoring of the Siting Factors and Evaluation Considerations that have been considered. 5.6. The final decision to proceed to borehole investigations and to construct a GDF will be made by the Secretary of State as set out in the Working with Communities Policy. 6.1. The health and safety of RWM’s employees, contractors and the public, the protection of the environment, and the security of our assets are of paramount importance in all that we do. Achieving high standards in these areas is critical to the delivery of our vision and mission. 6.3. RWM is committed to achieving high standards of performance and consistently delivering on our commitments to customers and stakeholders. In order to achieve the standards critical to the delivery of our vision and mission, RWM maintains an integrated management system which includes the application of independent oversight of the programme to support improvement and learning. 6.4. Assurance of the evaluations undertaken within the SE will be provided by RWM internal oversight. 6.5. RWM may also utilise further lines of independent assurance and advice (e.g. RWM’s Advisory Council and peer review by representatives from overseas waste management organisations) as appropriate. 6.6. RWM may also make use of benchmarking with overseas programmes, other UK infrastructure projects, and projects with community involvement, to inform its evaluation approach. 6.7. The consent-based Siting Process set out in the Working with Communities Policy applies in addition to the land-use planning and regulatory processes that will apply to a development of this nature and complexity; all of the usual opportunities for the public to scrutinise and have a say in the development of such a major infrastructure project will remain. 7.1. We have published this consultation online at www.gov.uk/rwm It can also be downloaded as a printable PDF from the website. 7.3. Your response will be most useful if it is framed with specific reference to the questions posed at the end of this section, though further comments and supporting evidence are also welcome. We also actively welcome the submission of evidence to support your response and RWM will give greater weight to responses that are based on argument and evidence, rather than simple expressions of support or opposition. 7.4. Please make it clear whether the views you submit are those of an individual or if they represent those of an organisation. If you are responding on behalf of an organisation, please tell us who the organisation represents and, where applicable, how the views of members were assembled. 7.5. If you would prefer to respond by email or letter, it would be very helpful if you could use our response template. It can be downloaded as a PDF or a Word document at: www.gov.uk/rwm or we can supply an electronic or paper copy on request. However we will consider all responses, whether provided on the template or not. 7.6. Please email your response to: siteevaluation@nda.gov.uk or write to us at the address above. 7.8. If you have any queries about this consultation or would simply like more information about the Site Evaluation document, please contact us via any of the channels shown above. 7.9. When the consultation ends, we will publish a summary of the key points raised. Members of the public may also ask for a copy of responses under the freedom of information legislation (primarily the Freedom of Information Act 2000, the Data Protection Act 2018, the General Data Protection Regulation (EU) 2016/679 and the Environmental Information Regulations 2004). If you do not want your response, including your name, contact details and any other personal information to be publicly available, please say so clearly in writing when you send your response to the consultation. Please note, if your computer automatically includes a confidentiality disclaimer that will not count as a confidentiality request. 7.10. You do not have to give us any information, and details of our Privacy notice 29 can be found on our website. The Charter explains how we will store and use your personal data. The policy also explains how you can request a copy of any information we hold about you. Are there any other sources of high level Requirements, other than Siting Process, National Policy Statement and Legal Requirements identified, that you think should be reflected in the Site Evaluation and why? An assessment of the similarities and differences between two or more sites. RWM’s approach to comparative assessment will be premised on an open and transparent approach based on the holistic consideration of the Siting Factors and underpinning Evaluation Considerations as well as the extent to which the community is engaged. The partnership between the members of the community, at least one relevant principal local authority and RWM, which will provide a vehicle for sharing information with the community and for finding answers to the questions the community may have about geological disposal, the siting process and how they, as a community, could benefit. A generic and non-site-specific document produced by RWM to set out the high-level and technical requirements on the RWM’s organisational management, site selection and evaluation and GDF design, construction, operation and closure, so that the disposal system can meet its fundamental need. A document produced by RWM to set out the high-level and technical requirements on the RWM’s organisational management, site selection and evaluation and GDF design, construction, operation and closure, so that the disposal system can meet its fundamental need. The evaluation considerations that underpin each of the six Siting Factors and which will be used to guide our site evaluations and discussions with communities. 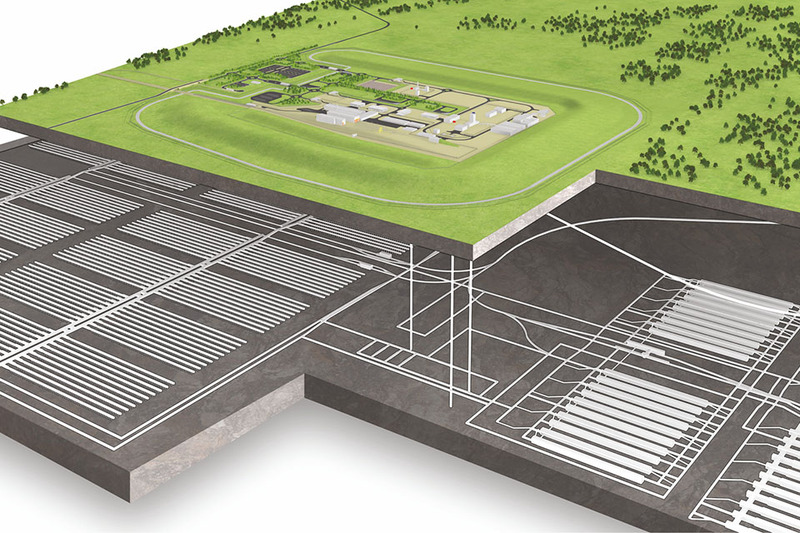 A long-term management option involving the emplacement of radioactive waste in an engineered underground Geological Disposal Facility or repository, where the geology (rock structure) provides a barrier against the escape of radioactivity. Higher activity radioactive waste includes the following categories of radioactive waste: high level waste, intermediate level waste, a small fraction of low level waste with a concentration of specific radionuclides sufficient to prevent its disposal as low level waste. Early contact with an Interested Party to help them to find out more about: the Siting Process; to understand whether a site/area put forward has any potential to host a GDF; and, to help them to decide whether they want to take their interest further. The specific types of higher activity radioactive waste (and nuclear materials that could be declared as waste) which will be disposed of in a geological disposal facility. The requirements derived from key legislative and regulatory instruments and regimes (as well as any relevant associated guidance regarding those regimes) which relate to the design and assessment, construction, operation and closure of a GDF. An exercise undertaken by RWM that brings together high level geological information from across the country relevant to the design of a GDF. The requirements established by the NPS to which the Secretary of State must have regard when determining applications made for development consent for certain geological disposal infrastructure under section 30A of the Planning Act 2008. A non-departmental public body established by the Energy Act 2004. It is a strategic authority that owns 17 UK nuclear sites. Relevant Principal Local Authorities are the district, county, or unitary authorities that represent all or part of the Search Area or Potential Host Community. The Potential Host Community is the community within a geographical area that could potentially host a GDF. The developer of a GDF and a wholly owned subsidiary of the Nuclear Decommissioning Authority. Together, the Siting Process Requirements, Legal Requirements and NPS Requirements. The Search Area is the geographical area encompassing all the electoral wards within which we will be able to consider potential sites. For areas which include potential for development under the seabed, the Search Area will comprise only that area on land. The six Siting Factors chosen to reflect what RWM believes, on the basis of international GDF projects and of UK infrastructure projects of similar size and complexity, are likely to be the key areas of focus for discussion with communities participating in the Siting Process. The six Siting Factors are intended to assist communities in understanding the various matters that RWM will necessarily need to consider as it evaluates the suitability of sites for hosting a GDF in accordance with the relevant Requirements. The consent-based approach established by the Working with Communities Policy for RWM to engage and work in partnership with communities and relevant principal local authorities in England for the purposes of identifying a suitable location for the development and operation of a GDF. The Siting Process Requirements are derived from the Government’s Working with Communities Policy, which sets out how RWM will work in partnership with interested parties, communities and the principal local authorities that represent those communities to identify a suitable site for the development of a GDF. The Working Group is formed in the early part of the process in order to gather information about the community and provide information to the community about geological disposal before a Community Partnership is formed. It comprises the Interested Party, RWM, independent facilitator, independent chair and any principal local authorities that wish to join. 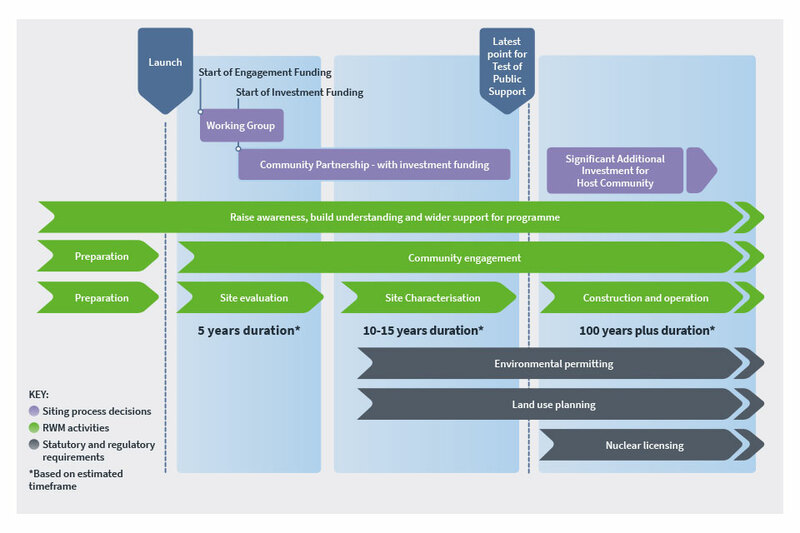 “Implementing Geological Disposal – Working with Communities”, An updated framework for the long- term management of higher activity radioactive waste, HM Department for Business, Energy and Industrial Strategy. 8.1. The Welsh Government has participated in the Managing Radioactive Waste Safely (MRWS) programme from 2001 and their current policy on implementing geological disposal is set out in two documents: Management and Disposal of Higher Activity Waste 30 and Geological Disposal of Higher Activity Radioactive Waste: Community Engagement and Siting Processes 31. 8.2. The Welsh Government consulted on Geological Disposal of Radioactive Waste: Working with Communities between 25 January and 20 April 2018. There will be a separate Welsh Government policy on the arrangements for community engagement in Wales that will reflect specific Welsh circumstances while being compatible with the key elements of the UK Government’s geological disposal programme. 8.3. In Wales, planning issues are considered by the relevant local authority in whose area the surface infrastructure is located. The Welsh Government recently consulted on changes to the consenting of infrastructure in Wales 32. It is proposed that both deep investigative boreholes and the Geological Disposal Facility would be included as Welsh Infrastructure Projects. In this process Welsh Ministers would act as the consenting authority. 8.4. The Northern Ireland Executive has responsibility for ensuring that any proposed Geological Disposal Facility (GDF) will not have an adverse impact upon the environment, health or safety of Northern Ireland. Any future policy decisions in relation to geological disposal in Northern Ireland would be a matter for the Northern Ireland Executive, which is currently suspended. 8.5. The Scottish Government is not a sponsor of the geological disposal programme, but does remain committed to dealing responsibly with radioactive waste arising in Scotland. In January 2011, the Scottish Government published its Higher Activity Waste Policy 33. Scottish Government policy is that the long-term management of higher activity radioactive waste should be in near-surface facilities. Facilities should be located as near to the sites where the waste is produced as possible. While the Scottish Government does not support deep geological disposal for Scotland, it continues, along with the UK Government and other devolved administrations, to support a robust programme of interim storage and an ongoing programme of research and development. 8.6. Of particular note and relevance to the SE are the Assessment Principles in Section 4 of the draft NPS which are summarised below. Security considerations - that proportionate protective security measures will be part of the design, with oversight from the relevant regulatory authority, and information disclosed as necessary to enable the making of an informed decision on any application for development. 8.7. As noted above, the Legal Requirements will be of fundamental importance during the Siting Process. RWM will need to ensure that its site evaluations are consistent with Legal Requirements and gather the necessary information for the purposes of informing and shaping its subsequent applications for the relevant consents. In this context, this Annex gives a brief overview of what RWM considers to be the key Legal Requirements that will need to be considered throughout the Siting Process, and which have therefore been highly influential in the development of the Siting Factors and Evaluation Considerations. 8.8. It should be noted in the context of the Legal Requirements discussed below that the UK’s independent nuclear and environmental regulators have no formal role in selecting a site for a GDF. Their regulatory roles will begin only after a site(s) has been selected for further investigation. The Environment Agency (EA), for example, will have a formal role from the time when sites for deep borehole investigations are selected, and the Office for Nuclear Regulation (ONR) will have a formal role from the time when a site for a GDF has been selected and the licensing process has commenced. The regulators will engage with stakeholders as requested to explain the regulatory processes and their role. They will only license or permit a GDF if it can be shown to meet the stringent regulatory requirements for protection of people and the environment. deep boreholes at a depth of at least 150 metres beneath the surface and developed for the purposes of obtaining information, data or samples to determine site suitability. 8.10. Applications for development consent at sites in England will be determined by the Secretary of State, informed by a detailed examination process and a recommendation by the Planning Inspectorate. 8.11. Any GDF-related development which does not fall to be consented under the Planning Act 2008 would need to be consented under the Town and Country Planning Act 1990. 8.12. The Environmental Impact Assessment (EIA) regime is designed to protect the environment by ensuring that the likely significant environmental effects of proposed development are properly assessed and considered during the consenting process. 8.13. The relevant legislation sets out procedures for identifying which projects should be subject to EIA and subsequently for assessing, consulting and coming to a decision on those projects which are likely to have significant environmental effects. 8.14. In circumstances where proposed development is subject to EIA, the applicant for consent must prepare and submit an Environmental Statement to the relevant consenting authority. The relevant legislation sets out what information must be included in an Environmental Statement. The Town and Country Planning (Environmental Impact Assessment) Regulations 2017, in respect of development which falls to be consented under the Town and Country Planning Act 1990. 8.16. Certain geological disposal infrastructure has been included within the statutory list of Nationally Significant Infrastructure Projects in the Planning Act 200835. This includes a GDF facility itself, and the deep boreholes necessary for the purposes of characterising a site and determining its potential suitability to host a GDF. Any applications made by RWM for development consent for such geological disposal infrastructure will be supported by an EIA. 8.17. To the extent that any development proposed by RWM falls to be consented under the Town and Country Planning Act 1990, RWM will assess the environmental impacts of the development in accordance with the relevant legislation and will prepare an EIA as required. 8.18. The requirements of the Habitats Directive36 and Habitats Regulations37 apply to plans and projects that are likely to have a significant effect on European protected sites. 8.19. Article 6(3) of the Habitats Directive provides that, where a proposed plan or project would be likely to have a significant effect on European protected sites, whether individually or in combination with other plans or projects, an appropriate assessment must be carried out to determine the extent to which European protected sites would be affected. 8.20. In circumstances where the appropriate assessment determines that the plan or project would not adversely affect the integrity of a European site(s), the plan or project may be approved. compensatory measures are put in place. 8.22. RWM will necessarily need to have close regard to the requirements of the Habitats Directive and Habitats Regulations throughout the Siting Process, in order to determine whether the proposed development of GDF infrastructure at a given geographical location would be likely to impact on a European site(s). RWM will engage closely with Natural England and the Marine Management Organisation in this regard. 8.23. Where appropriate, an HRA will be prepared by RWM to support its applications for development consent. The HRA will analyse the potential impact of the proposed development on any relevant European site(s). 8.24. The ONR licenses nuclear sites and is responsible for regulating safety and security on licensed nuclear sites in Great Britain. The ONR also regulates the safety of transporting radioactive materials and plays a key role in ensuring that the UK’s international safeguards obligations are met. 8.25. The UK Government has confirmed that a GDF will be a prescribed nuclear installation under section 1 of the Nuclear Installations Act 1965. This means that a nuclear site licence will be required during both the construction and operational phases of a GDF. Compliance with the licence conditions will ensure that all aspects of a facility adhere to strict safety and security requirements, including its overall design. The nuclear site licence for facility GDF located in England (or Wales) would be granted and subsequently regulated by the ONR. 8.26. The ONR and the EA work together in regulating the management and storage of higher activity radioactive waste on nuclear licensed sites to ensure that decisions about the management of that waste take into account the disposability of conditioned waste alongside the nuclear safety considerations. 8.27. The ONR is also responsible for regulating conventional health and safety requirements on nuclear licensed sites. The Health & Safety Executive will however be responsible for regulating the conventional health and safety aspects of certain activities which are carried out during the Siting Process (i.e. prior to the grant of a nuclear site licence) – for example, in respect of surface-based investigations where deep boreholes are being drilled to investigate the geological characteristics of a given geographical area. 8.28. The EA is responsible for implementing and enforcing environmental protection legislation in England. Its areas of responsibility include environmental pollution, waste management, flood risk management, water resources, fisheries and conservation. The EA also regulates disposals of radioactive waste from nuclear licensed sites as well as from other premises that use radioactive substances. Disposals of radioactive waste include radioactive discharges to air and water and disposal of solid waste to land, including disposals at the Low Level Waste Repository as well as geological disposal. 8.29. EA Guidance on Requirements for Authorisation sets out the requirements for a long-term environmental safety case for a GDF; this guidance is relevant in England and Wales. Under the Environmental Permitting (England and Wales) Regulations 2016, ‘intrusive investigation work’ requires an Environmental Permit; this means that the boreholes required to investigate a site will require an Environmental Permit, and there will be a staged authorisation process following this as RWM develops its safety assessments for underground investigations, construction and operation. 8.30. In the context of environmental regulation, it should be noted that the development and operation of a GDF in England will also involve Natural England (NE) and, if a coastal site is selected, the Marine Management Organisation (MMO). NE has specific responsibilities for making sure that England’s natural environment, including its land, flora and fauna, freshwater and marine environments, geology and soils are protected and improved. The MMO’s role is to license, regulate and plan marine activities in the seas around England.